The Consumer Council has said the cost of home heating oil in Northern Ireland has risen by 60% in the last three years. It is calling for the executive to take action and help families struggling to make ends meet. The council's Antoinette McKeown said there are eight ministers at Stormont with responsibility for energy costs. "If we had energy in the responsibility of one government department we may see some changes," she said. "Home heating oil has risen 60% in the last three years and 68% of homes in Northern Ireland are reliant on it. "That's why we have the highest energy bills in the United Kingdom." A filling station on the Andersonstown Road in west Belfast is selling home heating oil at the pump. One customer told the BBC he could not afford to bulk buy oil, so bought it by the drum instead. "We have to live off drums, we cannot get a bulk buy because it is just so dear," he said. "So you are constantly having to run and get drums. 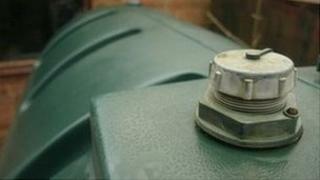 One drum of heating oil will get you maybe three days of heating out of it - at £15 for 20 litres that is pretty dear. "To get a bulk delivery you are talking a couple of hundred pounds and it is just not money you can find at this present moment in time. "Obviously now, because it is so cold, you have the heating on more, so you are using more and you're constantly having to run to get more oil." Another man buying oil at the same filling station said: "I just can not afford it any other way. "I will just take £6 or £7 worth at the minute, but I have to wait until the bank opens tomorrow so I can draw some money out and get some more then. "That's just the way it is. This amount will last me for today - with two youngsters in the house I just can't afford any more than that".